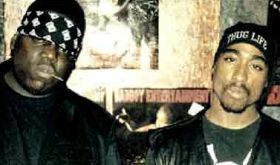 Tenacious British filmmaker Nick Broomfield puts himself right in the middle of this rather frightening documentary about the shooting deaths of rappers Tupac Shakur and Biggie Smalls (aka Notorious B.I.G. ), six months apart in 1996-97. The police have never solved the murders, and Broomfield shrugs off the obvious links with gangsta crime, cop corruption and even FBI complicity to get interviews with everyone he can, blundering from one place to the next until he gets to the bottom of the story, creating an intriguing picture of these two men along the way. Well, there's a lot more about Smalls, as his family and friends offer video footage, music and rather candid interviews, while everything about Shakur is further removed. As the film begins you feel that Broomfield is just stirring up a conspiracy, blithely wandering into offices and acting like he has no idea how inflammatory his questions are. Hints of an East/West Coast rap music feud are unconvincing, as are early comments about police involvement. And his whiney voiceovers make us think he's way out of his depth. Then the interviewees start squirming, giving obviously misleading information, and we realise he is onto something. His grating (and ingratiating) persona belies his sharp skills, and as details start to come together we start worrying for his safety. Indeed, the mere fact that this film exists could force him underground, Salman Rushdie-like. And perhaps that's what makes thus such a compelling documentary; it will grip even viewers who aren't interested in rap, as it cuts to the heart of American society in an unnerving way. How many docs have you seen that actually scare you?